The Muddy Rudder restaurant is a landmark in Yarmouth, Maine. Their e-newsletter was setup in Mail on the Mark as part of a rebranding by Visible Logic that redesigned their logo and web site. 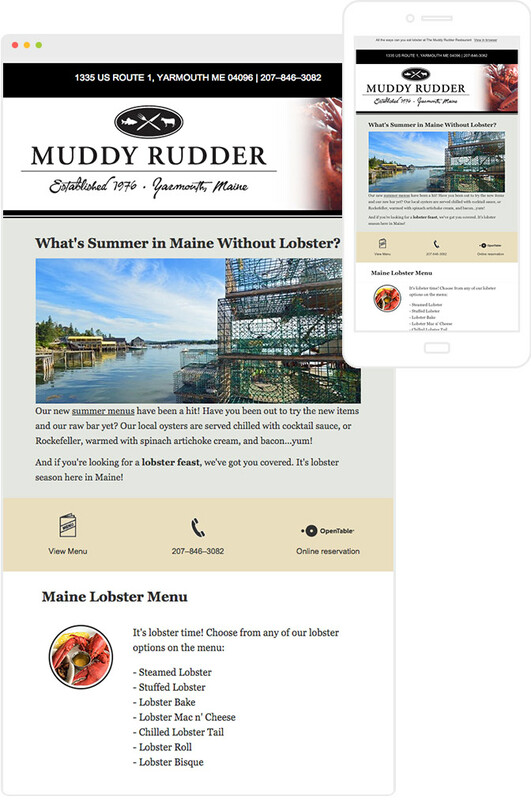 Initially, the Muddy Rudder was sending e-newsletters on their own, but the restaurant business moves fast, and no one had the capacity to take on the responsibility of staying in touch with customers consistently. The e-newsletters were getting clicks and increasing reservations, but restaurant patrons were missing out on specials and events and the restaurant owners were missing out on revenues with this haphazard approach. Not only did Muddy Rudder have a goal of sending out regular newsletters with updated information, they also wanted that information updated on their web site; but again, no one had time. Because Muddy Rudder now uses Mail on the Mark’s full service e-newsletter plan, they only have to send off a few lines of text about the upcoming month’s specials and events, and we take care of the rest: writing, graphics, newsletter sending and web site updates. All specials, as well as menu changes are announced in the e-newsletter, and are also reflected on the web site. Both the newsletter and web site are fully mobile optimized, since restaurant patrons are often on-the-go when looking for a place to relax and have a bite to eat. Reservations can be made with a simple click or phone call. Sending a consistent newsletter has increased web traffic to the Muddy Rudder web site, as well as generated reservations directly from the newsletter. In addition, the business owner no longer has to worry about finding time to write a newsletter. He needs only about 5 minutes of his time per month for a quick check-in and approval and his e-newsletter is sent and his web site is updated. The restaurant owner spends only about 5 minutes a month and we do the rest. After a quick phone or email to us about menu changes and upcoming specials, we prepare the e-newsletter and update relevant web site content. The restaurant’s e-newsletter always drives reservations. Now that the e-newsletter goes out consistently, there is a bump in reservations month after month.